David Aarons, a Jamaican pannist and doctoral student in ethnomusicology, began playing the steelpan at his church in Kingston where he developed a strong foundation in music that led to a thirst for more musical knowledge and experiences. He has since earned a Bachelor of Arts degree in music from the University of the West Indies (UWI), St Augustine, and a Master of Music degree in steelpan performance from Northern Illinois University (NIU). 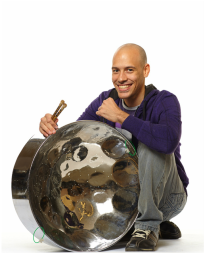 While pursuing his degree in Trinidad, David simultaneously completed a certificate in steelpan building and tuning at Panland Trinidad and Tobago Instruments Ltd and has subsequently worked with a number of bands in Jamaica as a tuner. While at NIU, David was named a joint winner in the NIU Concerto Competition in 2010 for his performance of Liam Teague’s “A Visit to Hell.” David has performed with a number of steelbands in the United States, Jamaica, and Trinidad and Tobago. He is currently pursuing a PhD in ethnomusicology at the University of Washington with research interests in the music of diasporic communities and return movements (specifically repatriated Rastafari in Ethiopia), as well as religious, community, and popular musics in the Caribbean. His most cherished musical achievement to date has been the design and construction of a steelpan capable of playing microtonal pitches for specific Middle Eastern compositions.